We had a relatively quiet weekend though, keeping to our small corner of Orange County. On Thursday I had my BBQ with work friends at the casa and that went pretty well. I work with a group of pretty neat and interesting people so it makes for lively gathering. On Saturday we had dinner with a friend from Chris' from business school (and her husband). It's lovely to have friends that are married so we don't feel like the odd couple out. And then this morning I went hiking (see pictures below) with the Waterstone Hiking Club and then we gathered at Mindy's house in Laguna for a BBQ. Chris and I escaped early so we could get massages in Costa Mesa. Oh...I'm hooked. It's so decadently luxurious. 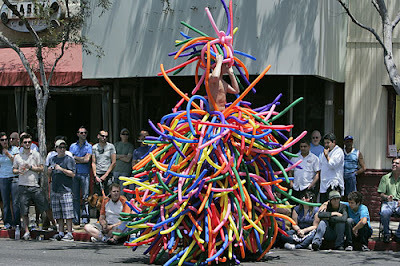 By the way, the picture (above) is from the LA Gay Pride Parade today. I thought it was hysterical. I hear ya on the massages! I got one yesterday at Massage Envy and it was fab-u-lous!!! And I'm sure it feels great to you after all of the hiking.